Dartmouth Alumni Magazine, July/August, 2011. On a spring day in 1981 a group of earnest and eager students–many having just returned from a quarter in Spain—sat around one of those massive oak tables in Dartmouth Hall, discussing the poems of the Primer Romancero Gitano by Federico García Lorca. The leader of the discussion was professor Robert Russell. García Lorca was strangely both close and far away for an American student in the early 1980s. More than 40 years had passed since he was assassinated by fascist thugs in his native Granada at the outbreak of the Spanish Civil War (1936-39). The Spain that we Dartmouth students were visiting in those years was in the midst of a euphoric and somewhat giddy transition from dictatorship to democracy. In many ways the country bore little resemblance to the nation that four decades before had torn itself apart and martyred its greatest living poet and playwright. And yet, in other ways, that fratricidal Spain of the Civil War and franquismo—the period from 1939 to 1975 when dictator Gen. Francisco Franco ruled—was also eerily close to us. Many Dartmouth students were in Spain in the winter of 1981, when a certain Colonel Tejero tried to ignite a military rebellion that would have undone the fragile democratic gains made by the country in the immediate post-Franco years, just as Franco had risen up to erase the progressive gains made by the Republic in the 1930s. For many of us Professor Russell was a living bridge to that distant, but proximate, tragic Spain. We knew that Russell had known, and in some cases studied with, some of the great Spanish Republican intellectuals who found refuge in American colleges and universities after Franco’s victory: figures such as Pedro Salinas and Jorge Guillén, Américo Castro and Francisco García Lorca, Federico’s brother. And though we wouldn’t have been able to articulate it at that time in these terms, I think many of us sensed that Russell—like those great Spanish intellectuals in exile—saw the teaching of Spanish literature not as some kind of linguistic or academic exercise, but rather as a solemn—and even sacred—task: the task of keeping alive the texts and values of Spain’s liberal tradition during the long, dark night of Franco’s dictatorship. It has taken me 25 years in the profession and a lot of research to come to this provisional and partial explanation of the force and impact of Russell’s extraordinary teaching. But even without that knowledge, even as undergraduates, I think we somehow all sensed that we were participating in, and being entrusted with, the keeping of a flame. What was that flame? What were those values we were being bequeathed and entrusted with? Certainly it wasn’t the names and dates of this or that author or the plot or setting of this or that novel. Even for those of us who became professional Hispanists, those things that we learned at Dartmouth would fade away like a dream at dawn. My best depiction of the flame is drawn from something that happened in the classroom almost 30 years ago, when that group of undergraduates, led by Russell, was exploring García Lorca’s poetry. That will go from the South to the North. Russell let another pool of silence puddle up on that long oak table—I would later learn that managing silence is one of the toughest techniques in the art of teaching—before launching into an explanation that has stayed with me to this day. In García Lorca’s time telegrams in Spain were blue; everybody knew that. Only a child—or a stranger—would even notice the blueness of Spanish telegrams. For a jaded adult, telegrams are blue like the sky is blue—they are necessarily and essentially blue and, therefore, their blueness is unworthy of notice or mention. García Lorca’s great poetic achievement, here and throughout his work, Russell explained, was to capture the pristine gaze of a child who can still be struck by the strangeness of the ordinary. For the child and the stranger, telegrams are only accidentally or contingently blue—they could just as well be green or white or mauve. “The great modern poet,” Russell concluded, recreates the gaze of the child and, in so doing, jolts the reader out of complacency, out of the comfort of the given.” The child, the poet and the reader realize: Another color is possible. If I’ve dwelled so long on this anything-but-telegraphic account of a seemingly trivial anecdote about a telegram, it is only because for me it captures the core of Russell’s legacy. He taught us that the child, the poet, the stranger and the attentive student of literature all share an invaluable skill: that of being able to see things as if for the first time, of always perceiving the monochromatic status quo—the way things are—against the rainbow backdrop of the way things have been and, more importantly, the way things might someday be. This double vision, I would come to learn, is not just some kind of luxury to be enjoyed only by leisured humanities students. The ability to constantly renew one’s perceptions, to taste the strangeness of one’s tongue, is at the core of creative, enlightened and tolerant citizenship. This double vision, honed by the study of foreign languages, travel and study abroad, and by sensitive reading of literature, is, in the end, the real legacy, the true flame that has been lovingly preserved and passed on with wisdom and passion by our mentor and friend, Bob Russell. James D. Fernández is an associate professor of Spanish and Portuguese at NYU. From 1995 to 2007 he served as the director of NYU’s King Juan Carlos I of Spain Center. This piece is based on remarks he made at a 2008 dinner in honor of Professor Russell, who taught at Dartmouth from 1957 until his retirement in 1991. 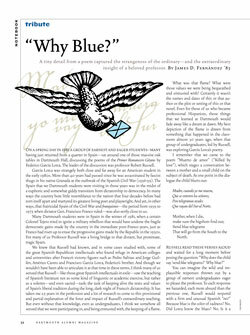 See “Why Blue?” as it was published on-line in the Darmouth Alumni Magazine. Well written! “Managing silence is one of the toughest techniques in the art of teaching-” SO good! Love the layers of meaning in the article.